A private site for reflecting. The Center for Continuing Formation was built by St. Mary’s in 1996 in response to the teaching on the priesthood and priestly formation of St. John Paul II. The pastoral emphasis and spirit of St. Mary’s Seminary today is perfectly expressed in The Center for Continuing Formation. Here, we offer special programs each year for pastors, newly ordained priests, and senior priests. It also hosts various bishops’ meetings, ecumenical gatherings, and other conferences as well. The New Pastors Program, held every November, is the most popular priest program we offer. The Center, which adjoins the main seminary building and yet provides great privacy, is a thirty thousand square foot facility with thirty private, three star guest rooms and suites, and a variety of conferencing space and small meeting rooms. The Center also has an oratory and private chapel as well as its own dining room. Conference space rentals include a large room that will seat as many as 58 and smaller rooms that will seat from 4 to 30. 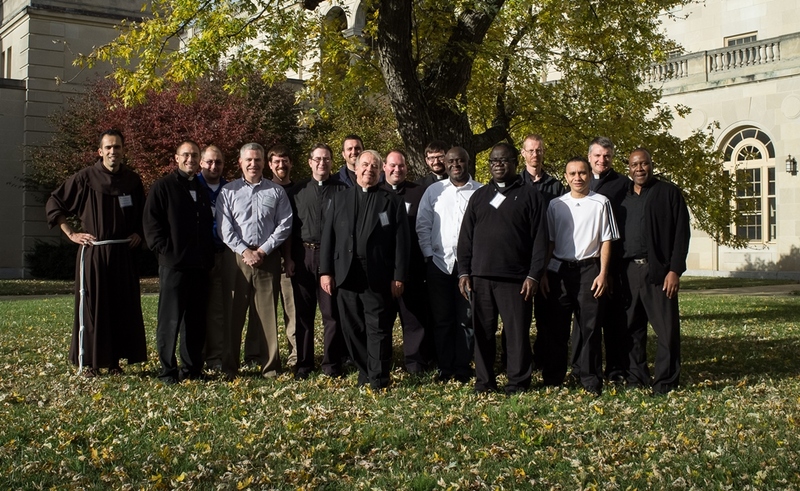 St. Mary's Center for Continuing Formation offers and hosts a variety of continuing formation programs for priests in the spirit of the Bishops' new Basic Plan for the Ongoing Formation of Priests. St. Mary’s Seminary & University’s Pinkard Scholars is the cornerstone of Youth Theological Studies at SMSU. For more information about any of our conference facilities or space rentals, please contact our offices directly.